ORLANDO, Fla., June 27, 2017 /PRNewswire/ -- SeaWorld Entertainment, Inc. (NYSE: SEAS), a leading theme park and entertainment company, today released its 2016 Corporate Responsibility Report. The report provides an overview of the company's everyday operations that support its mission to provide experiences that matter, inspiring people to protect animals and the wild wonders of our world. 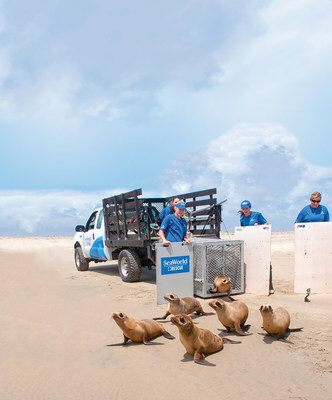 The inaugural report showcases the actions SeaWorld is taking to ensure the health and well-being of the animals in its care, rescue and protect animals in the wild, minimize the environmental impact of its operations and create a strong culture where employees are engaged and connected to the company's mission. "People want to know that they are supporting companies and causes they believe in," said Joel Manby, President and Chief Executive Officer of SeaWorld Entertainment, Inc. "We are demonstrating that our parks can be fun and thrilling while also being educational and inspirational. When our guests visit one of our parks, we want them to know they are helping support the rescue of thousands of animals every year, as well as ongoing research and conservation efforts around the world." SeaWorld is a world leader in animal rescue, having rescued and rehabilitated more than 2,000 animals in 2016 alone. The company recently announced a major milestone in 2017 – over 30,000 ill, injured, orphaned or abandoned animal rescues since the company was founded. Caring for imperiled animals has always been a core value of SeaWorld. Each year, the company dedicates its experienced animal care personnel, including veterinarians, trainers and specialists, to fulfill the company's purpose. This commitment, together with materials, facilities and equipment, has been valued at approximately $10M annually. In addition to this in-kind support, in 2016 SeaWorld provided $3.5M in cash donations to conservation organizations and local community nonprofit organizations. SeaWorld has also supported the SeaWorld & Busch Gardens Conservation Fund since its founding in 2003. In 2016, the fund granted $1.6M in support for wildlife research, habitat protection, animal rescue and conservation projects around the world, bringing the total granted by the Fund since it began to more than $14M. In fact, the Fund has supported over 1,100 projects in 75 countries and on all 7 continents. All three SeaWorld parks (Orlando, San Diego and San Antonio), Discovery Cove and Busch Gardens Tampa Bay are accredited members of the Association of Zoos and Aquariums (AZA), reflecting SeaWorld's commitment to applying world-class standards of animal care. SeaWorld's commitment to conservation includes efforts to reduce the environmental footprint of its operations. Over the last three years, SeaWorld's parks have improved their rate of recycling by 20% and reduced their energy usage by approximately 4%. Employees of SeaWorld are engaged and committed to the company's purpose and mission. Nearly 90% of SeaWorld's employees stated they understood and believed in the company's core purpose. Half of SeaWorld's leaders are women and 43% of its leaders are minorities, a reflection of SeaWorld's commitment to create an inclusive workplace that reflects the diversity of the millions of guests who visit its parks every year. "This first Corporate Responsibility Report is an important step in SeaWorld's commitment to be open, transparent and proactive in how we engage and communicate on key issues," said Manby. "We hope it will provide a platform for ongoing conversation and feedback from our stakeholders." Visit www.SeaWorldEntertainment.com to read the full report. SeaWorld Parks & Entertainment™ is a leading theme park and entertainment company providing experiences that matter and inspiring guests to protect animals and the wild wonders of our world. The company is one of the world's foremost zoological organizations and a global leader in animal welfare, training, husbandry and veterinary care. The company also rescues and rehabilitates marine and terrestrial animals that are ill, injured, orphaned or abandoned, with the goal of returning them to the wild. The SeaWorld® rescue team has helped more than 30,000 animals in need over the last 50 years.